In this article, you will learn to use break statement to transfer control of the program. How break statement works in Swift? How break statement works in case of nested loops? How labeled statement works with break? In the above program, the sequence being iterated over is a range from 1 to 5. The value of i is set to the first number in the range (1), and updated to the next number of the range on each iteration. The loop also contains an if statement with expression i == 4 . The expression when evaluated to true (on 4th iteration) executes the break statement and the for-in loop terminates. It then jumps outside the loop to print The end. In the above program, the test expression of the while loop is always true. When the currentLevel is greater than finalLevel, break statement inside the if block is executed. The program then breaks out of (terminates) the while loop and executes the statements after the loop, i.e. print("outside of while loop").. In the above program, break statement inside the if i == 4 only terminates the execution of the inner loop for i in 1...5. However, it continues the execution of the outer loop for j in 1...2. But what if you want to break the outerloop for j in 1...2 as well. For that, we use labeled statements in Swift. Statements that have prefixes in the form (label : Statement) are called as labeled statement. The label is an identifier which you can refer later in the break or continue statements. To learn more about labeled statements, visit Swift labeled statement. How labeled statement with break works? Here, label is an identifier. 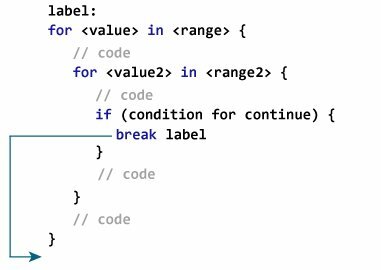 When break statement executes, it terminates the loops inside the label, and the program jumps to the statement immediately following the labeled statement. In the above program, there are two labeled statements outerloop: for j in 1...2 and innerloop: for i in 1...5. The label names outerloop and innerloop can be used with the break statement. The statement break outerloop terminates both the loops and ends the program. 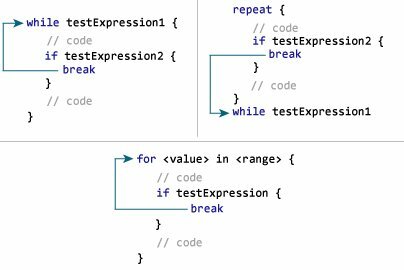 If you are familiar with other programming language like C, C++, Java, etc, break statement is used to terminate switch statement. But in Wwift, switch statement finishes its execution as soon as the first matching switch case is completed. Therefore, it's optional to add break at the switch case in Swift. To learn more, visit Swift switch statement.